Hey Doc, what should I feed my dog? This is a difficult question to answer. There are so many foods out there on the market these days, that as consumers we need to learn how to figure out what is in the food and what is best for my particular dog's needs. How many of us read the labels on our own foods? Do you read the label on your dog food, or simply listen to the most engaging commercial on television? We need to learn how to read the labels for a better understanding of the food contents and the quality of the food. In general, a brand name food is better than a generic food. Just like with our food, the higher the quality of the ingredients that go into the product, the better the food is. So, let's start by saying that for most animals foods with dyes are not good, because dyes are not a natural part of food, nor do they have any nutritional value. 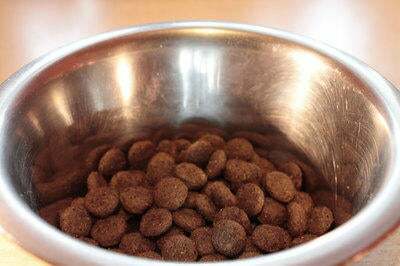 Since most owners prefer convenience, dry food was developed to feed dogs because it is easier and more convenient to use. In order to get the food to stay together, the companies had to use grains as binding agents. These grains are processed to be better digested and do have some protein content, as well as some fatty acids and are a source of carbohydrates for energy. As a result, many companies use quality grains and meat sources to produce a food that has all the necessary nutrients for a healthy animal. However, a company can use lower quality ingredients and still get the food to pass the necessary testing and yet not have usable sources of nutrition. Research the company using reliable sources of information. Remember, not everything you read on the internet is true. In our minds, meat is better than meat meal ( ex: chicken vs chicken meal), just because it sounds better. But, as with any ingredient, a reliable source provides a quality ingredient. Meat meal is sometimes used to increase the protein content without increasing the water content of the food. Are grains really bad? Just like with people, if you are allergic to them, yes. But if you are not allergic and you are using a quality food, no they are not. There are some things to consider about using a grain free food. Most grain free foods are higher in protein and often calories, too. So, consult with your veterinarian to see if the level of protein and calories are appropriate for your dog's stage of life. As the animal ages, higher protein levels are not always good. And depending on your pet's activity level, extra calories may put on extra pounds that will be unhealthy. Also, many grain free foods combine many novel ingredients (for instance sweet potato, salmon, potato, barley) which may pose a problem if your pet truly does become food allergic. Food allergies can develop to any ingredient that the animal is fed. Usually, food allergies develop after a prolonged period of feeding the food, often years, not months or weeks. The signs of food allergies can be confused with other allergies as they are similar. Signs include itching of the face and feet, this can present as scratching, rubbing, chewing or licking, ear infections and sometimes gastrointestinal signs (vomiting, diarrhea, gas). In most cases food allergy signs are non-seasonal, but since we do not have dramatic changes in the seasons here in Florida, this can be difficult to see. The only way to truly diagnose a food allergy is with an elimination diet. An elimination diet means a novel protein source and a novel carbohydrate choice for 8-12 weeks. Dermatologists feel that most skin and blood tests are not completely accurate for food allergies (although they are for pollen allergies). So once the elimination diet has been fed and the signs have subsided, the dermatologist would challenge the dog by adding back in one ingredient at a time to determine to which ingredient the pet is sensitive. So, you can see that if the animal has been fed multiple sources of carbohydrates and protein, the choices for novel ingredients will be limited. Now, a little about labeling. The FDA and AAFCO (Association of American Feed Control Officials) regulate the labeling of food. There are two ways to get a food labeled as complete and balanced. One is to formulate the food based on the established profile for the animal. The other is to do food trials with strict guidelines that prove that the food is nutritionally adequate. The statements on the labels will be different based on which method was used. These exact statements can be found at the FDA website under animal and veterinary. Ingredients are required to be listed by weight, but be careful about comparing different foods as water content can affect the order of ingredients. Comparing a wet food with a dry food without calculating to remove the moisture content from the wet food will not be an accurate comparison. To be labeled "for all life stages" a food meets the requirements for growth and reproduction. Whereas a label for adult maintenance does not meet the needs of an animal that is growing or producing milk for the puppies. So, while a diet for all life stages may not be bad, it may not be necessary for your pet. Consult with your veterinarian to determine what is best for your pet at his/her current stage in life.